Lovely but tough as nails, Lael Click is the daughter of a celebrated frontiersman. Haunted by her father's former captivity with the Shawnee Indians, as well as the secret sins of her family's past, Lael comes of age in the fragile Kentucky settlement her father founded. Though she faces the loss of a childhood love, a dangerous family feud, and the affection of a Shawnee warrior, Lael draws strength from the rugged land she calls home, and from Ma Horn, a distant relative who shows her the healing ways of herbs and roots found in the hills. But the arrival of an outlander doctor threatens her view of the world, God, and herself--and the power of grace and redemption. This epic novel gives readers a glimpse into the simple yet daring lives of the pioneers who first crossed the Appalachians, all through the courageous eyes of a determined young woman. After having read Laura's latest book, "The Colonel's Lady" and it instantly became one of my absolute favourite books, I was keen to get a hold of her earlier two books. "The Frontiersman's Daughter" has been sitting on my bedside table for a few weeks now because her books are not something I like to squeeze in a chapter here and there between toddler tantrums and nappy changes. I like to get in good sized chunks of reading time when I'm lost in a Laura Frantz book, so I have a chance to get completely absorbed in the story. Lael is an interesting girl, and the story follows her from the age of thirteen until she is twenty one. I confess it took a little while for me to warm to her simply because I didn't understand the environment she was in. But as I read on and the way of the rugged frontier in colonial Kentucky became known to me, I came to admire her fortitude and determination. One thing is for sure, Laura can sure create a hero! Lael's tale takes us on a journey through her love life over the years, and she struggles to understand her overwhelming feelings and past hurts as she tries to find her place in the world. 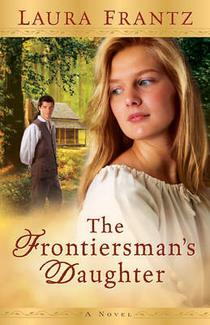 There's a regular frontiersman, an Indian and a doctor all caught up in her melting pot of emotions. Laura created them all flawed, yet endearing and enchanting in their own way. I was able to understand and identify with her confusions and even the allurement of the Indian chief which would have been such a taboo in that time. But Doc Justus is certainly the crème de la crème :) And that gorgeous Scottish accent just makes him all the more appealing. OH MY! Love that last line! It's the creme de la creme of your entire review:) I so appreciate your insights and that you stayed with the story even though it's not a fast action read, as you said. That makes this author very happy! You write the best reviews, Helen. I'm so thankful we've connected through our love of good books! BTW, I still get regular mail about Captain Jack! I'm so pleased you like the review Laura! I am truly thankful for the enjoyment and inspiration that your gift of writing brings :) I think I'm not surprised about all the interest regarding Captain Jack! My best friend is currently reading my copy of "The Colonel's Lady" and she told me she is enjoying it and feels like she is living inside the story :) So I think you have won another fan! God bless you and your family during this wonderful season!